Aviyal, which literally means cooked in water, is a very typical type of curry with vegetables from Kerala. Its density can vary depending on tastes and preferences. The recipe may also include the use of curd (a type of Indian yoghurt), and, if made with a lot of sauce, it is usually eaten with boiled rice. The recipe we were shown uses fresh coconut giving the dish a sweet and fruity note. Cut the veggies into small pieces. Add the masala to the veggies together with a small bundle of fresh coriander, salt to taste and some water to simmer in. Cook slowly with lid on for at least 20 minutes. 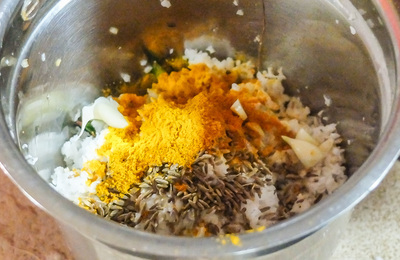 When the curry is ready, add a scant tablespoon of coconut oil.